This all-star Met Barbiere’s defining quality is old-fashioned charm. Its massive revolving set is quintessential eye-candy, complete with palm trees and Moorish architecture to evoke the Sevillian setting, and though the colorful costumes update the action from Beaumarchais’s 18th century to Rossini’s own early 19th, the atmosphere is cozily traditional. The staging is pert, gently witty and funny with no excessive zaniness. Some of the jokes have a corny, “oldest trick in the book” quality (e.g. Figaro sneezes while hiding and Rosina quickly holds her finger under her own nose to make Bartolo think it was her), but this somehow adds to the charm of the performance. The only thing, really, that separates this Barbiere from a quaint provincial production is its sheer size (Act I’s ragtag musicians even get a real horse-drawn wagon to ride in), as well as the caliber of the cast. Leo Nucci is an endearing Figaro, slightly small-voiced for the venue, but with plenty of warm lyricism, dapper wit and priceless facial expressions. Kathleen Battle, the production’s star attraction in 1989, is a winsome soprano Rosina with a tone like liquid silk and effortless, sparkling coloratura. Predictably and for better or worse, she’s very much an ingénue Rosina, spunky in a cute, dainty way, rather than the fiery proto-feminist others portray. Her handsome, dashing Count Almaviva, Rockwell Blake, compensates for a slightly gritty timbre with magnificent technique and agility, rightfully earning the inclusion of “Cessa di piú resistere.” I suppose it’s a matter of taste whether his lack of goofiness in his disguises equals blandness or refreshing restraint. Arguably the true star of the show, however, and definitely the liveliest presence onstage, is Enzo Dara’s hilarious Bartolo. Whether blustering, jabbering, mincing, dancing, or having angina attacks and popping pills mid-aria, the man is a living cartoon character in the best possible way, with a rich, resonant bass and outstanding patter skills. Ferruccio Furlanetto, in his second filmed turn as Don Basilio, is expertly oily and cavernous-voiced as always, while Ralf Weikert leads the Met Orchestra in a solid, lively reading of the score. 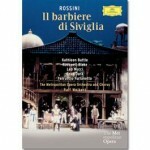 This Barbiere isn’t necessarily the best available, but still, it would make a good introduction to the work. With its sweet, simple charm and both eye- and ear-candy to spare, any lover of comic opera should enjoy it. Bravo. Refreshing restraint on the part of Rockwell Blake who let the music and amazing technique carry the role.